The Baby Grand Piano (Black or White) from Imagiix (ToyDirectory) is a totally new concept in the design and manufacture of toy pianos, designed to encourage and enable children 3 and up to "conduct concertos." Features of the 25 key piano include 10 distinct rhythm patterns (March, Swing, Country, Disco, Rock, Rumba, Waltz, Pop and more); 4 distinct timbers (Piano, Organ, Trumpet and Bell); 15 high-quality pre-programmed songs; a record and re-play option; an adjustable volume control; power/record indicator lights; and an automatic shut off switch. The latest in Putumayo World Music´s acclaimed music series for children features a star-studded cast of artists, from Arlo Guthrie to Keb´ Mo´, offering a mix of folk, blues, bluegrass, swing and reggae selections that families can easily sing along with. Sing Along With Putumayo ($15.98) includes entertaining and informative liner notes in English, Spanish and French, as well as song lyrics, artist biographies and Nicola Heindl´s distinctive colorful illustrations. 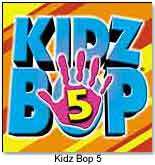 Kids will keep on bopping and singing to the latest pop tunes with Kidz Bop 5, the latest volume from the best selling children´s music series from Razor & Tie. The CD features hit pop songs sung by kids for kids, such as "Hey Ya," "It´s My Life," "Me Against the Music," "Are You Happy Now," "Crazy in Love," and more. Sara Hickman´s new CD, Big Kid (Sleeveless label) (ToyShow), is targeted towards children who are learning to read, write explore and create. Throughout its 24 tracks, Hickman utilizes an assortment of musical styles-from hip-hop and country to folk and swing-to create zany yet educational, movement-oriented songs. The CD also includes a selection of original poetry written and read by guests of all ages. Music Wands, sculptured metal wands from Tree Blocks (ToyDirectory), carry a unique tone that is created simply by tapping the end on a hard surface. 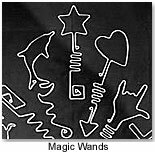 The wands, which come in a variety of shapes, from stars and hearts to cats and dolphins, serve as attention grabbers, gift embellishments, acoustical science experiments and more. An innovative CD inspired by parents and produced in consultation with speech and language experts, Time to Sing! II from the Center for Creative Play (a non-profit play center in Pittsburgh) includes 24 family favorites paced specifically for singers of all abilities. 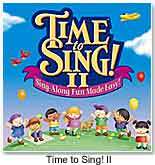 Fun songs to sing along range from an Elvis-style “Rock a Bye Baby” to a Sinatra-influenced “Rubber Duckie.” Time to Sing!, the first CD in the series, has been a hit among parents and educators alike, and has won a variety of awards since its release. The new CD, due out this month, is sure to garner accolades as well. Uncle Robot: Songs for Young Families, a new musical CD produced by Greene Street Records (ToyDirectory) and performed by Karl Williams, features a compilation of songs about special moments in a young family’s life. Included are a series of songs recounting the arrival of a baby, the celebration of a first Christmas, potty-training and learning to tie shoelaces. Kidz Bop 4, the most recent title from Razor & Tie, features hit pop songs sung by kids for kids, such as “Sk8ter Boi,” “Miss Independent,” “Jenny From the Block,” and others. The newest album from the best-selling Kidz Bop Kids children’s music series recently was certified gold. 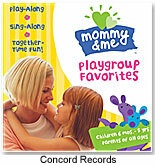 Concord Records announces the first releases in an all-new Mommy & Me music series that enhances parent-child interactions. Featuring activities and music developed for the international playgroup phenomenon, Mommy & Me launches with two “Together Time” CDs: Playgroup Favorites and More Playgroup Favorites. Video and DVD versions of Mommy & Me Together Time will also be available from Universal Home Entertainment on January 20. They’ve performed at the White House, had their own PBS special and sold out the Grand Ole Opry five years in a row. Now, kids can enjoy The Animal Band live in a 45-minute concert film on DVD/VHS produced by KOCH Entertainment (ToyDirectory), featuring state-of-the-art special effects and digital animations. Special features include an additional song, a photo gallery and coloring pages. Tanner’s Manners (ToyDirectory, ToyShow) has recently launched the “Tanner’s Manners: Be a Kool Kind Kid” CD featuring 17 original songs. 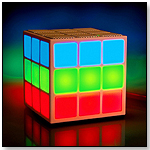 Each song teaches a different social skill in an entertaining way. Using poems, songs, role-playing and other activities, Tanners Manners provides kids from ages 2 to 12 with an engaging, comprehensive grounding in good manners and ethical behavior. Recently, Campbell’s Labels for America(TM) and Tanners Manners teamed up with other national organizations to help America’s schools and encourage volunteerism in their local communities. In the same spirit, Tanner’s Manners will be offering special pricing on their products for those schools registered with the Labels for Education(TM) Program. Madacy Kids (ToyDirectory) is planning the release of their first audio product in the Care Bears audio series called Meet the Care Bears. The Care Bears are a team of adorable bears, each with its own way of sharing feelings and its own bright tummy symbol. The CD features a collection of 12 original songs and traditional favorites celebrating key Care Bear values. KIDZUP (ToyDirectory) has released a value added package called the Crayon Series, containing a 36-track music CD, crayon and 5-page coloring book. Four new CDs from the Crayon Series include Kid´s Favorite Songs (Old MacDonald, Twinkle Twinkle, A Bicycle Built for Two, etc), Kid´s Party Songs (Ring Around the Rosey, If You´re Happy And You Know It, etc), Kid´s Playtime Songs (Take Me Out to the Ballgame, Hokey Pokey, Miss Mary Mack, etc) and Kid´s Sing-Along Songs (The Wheels On the Bus, Yankee Doodle, The Ants Go Marching, etc). 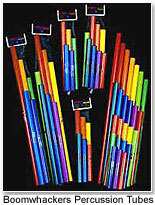 Whacky Music, Inc. (ToyDirectory, ToyShow) is introducing a wide variety of new products for its award-winning line of Boomwhackers Tuned Percussion Tubes, including an entire series of educational materials for assisting teachers in using the musical tubes to teach music in the classroom. Some of the many products introduced include the Boomophone XTS Whack Pack combines the 8-note C Major Diatonic Scales Boomwhackers set with the new XyloTote Tube Holder and Boomwhacker Whacker Mallets, the color-coded Whack-a-Doodle-Doo! Children’s Songbook and an Octavator Tube Cap. The new Treble Extension Set contains 7 Boomwhackers Tubes in pitches above what was previously available, running chromatically from high C# to high G.
Award-winning Singer Songwriter Susan Salidor (ToyShow) announces the release of her latest children’s CD, “Come and Make A Circle” – 20 Terrific Tunes for Kids and Teachers. The CD, Salidor’s 5th, features 12 original songs and 8 classics, all designed to make children smile and sing through music class, play time and car trips. Featuring Susan on her autoharp and an accompanying group of talented musicians, Salidor’s “Come and Make a Circle” is sure to garner the critical praise her earlier recordings (Little Voices in My Head, 1995) (By Heart, 1996 Parent’s Choice Gold), (Color Me Singing, 1998 Parent’s Choice Gold, Oppenheim Toy Portfolio Platinum) Shiny New Shoes, 2001 (Parent’s Choice Silver Award) received.